For Smashwords, you format your file, you upload it to Smashwords, their algorithm thing determines if the document is formatted correctly--if it is and you get accepted, they can distribute your book to a number of vendors, including Amazon, Kobo, Apple, and B&N. That way, the author has a central place to make changes if need be, doesn't have to go insane changing the file to suit the various needs of the different vendors' requirements, and Smashwords handles payment (they take a cut, of course) and taxes. Since Smashwords distributes to Kindle, I figured that the formatting couldn't be that different. Turn off the Automatic features on Word. Set your Styles--in my Word, it's under the Format menu. This is what I remember from Desktop Publishing: the style sheet is everything. It's how the text organizes on the screen. So, essentially, you have a Normal setting, which is what the bulk of your text will be. Then you can add in other styles as you go. For example, you can set a style for Chapter headings. So, like, if you want your Chap headings to be 14 pt. instead of 12 pt. 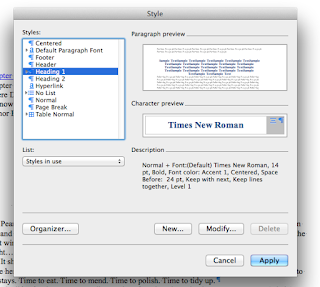 and centered, you can set it that way in the style sheet and when the time comes, highlight the chapter headings and choose your Chapter style to make that title do what you want. I also used the Style function to set scene breaks, so I can highlight and set them up so they'll be consistent. Smashwords says don't use the built-in table of contents in Word. Instead, as you go, bookmark your chapter titles, create a list at the top of your doc for the Table of Contents page, then highlight Chapter One, go to create hyperlink, and then find the appropriate bookmark and voila--a linked Table of Contents! Cool! So glad you're finding a way to get it all together! I think it's worth it to have it distributed across multiple platforms. Oh, I think so, too. Broader audience reach that way. Way cool. I look the bookmark trick instead of word's built-in table of contents. Yeah, that's what I was getting confused with in the Kindle guide. It wasn't explained as clearly. Now, no page numbers!